Today is the 206th anniversary of Abraham Lincoln's birth (1809--April 15, 1865). This year, 2015, is also the sesquicentennial of his assassination. Lincoln, our 16th president, is best known for guiding the country through the Civil War and helping end slavery. Especially in Illinois, the Land of Lincoln, reminders of this great man live on from Lincoln Avenue to Lincoln Park. Most know his story from his humble beginnings to the White House. Abraham Lincoln spent less than 12 months attending school. Lincoln was born in a log cabin that was only 16 by 18 feet in size and had a dirt floor. The lanky Lincoln was 6’4” tall and weighed 180 pounds. Just as an envelope served as his stationary for the Gettysburg Address, Lincoln's stovepipe hat served as his desk and memorandum book where he kept mail, his bankbook and important papers. Santa Claus, he wasn’t but Lincoln was the first president to sport a beard. His favorite poem was Mortality by William Knox. Abraham Lincoln favored women's rights in an era when women could not vote. Abraham Lincoln's salary as president was $25,000 a year. The number of books written about Abraham Lincoln is in excess of 15,000. 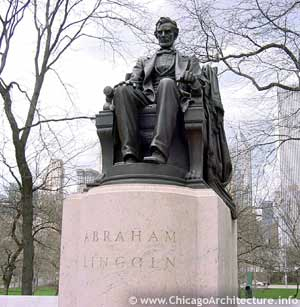 The number of Lincoln statues goes well into the hundreds, maybe more, with two iconic ones in Chicago: Seated Lincoln in Grant Park and Lincoln the Man in Lincoln Park. In order to become a lawyer in Illinois in 1833 all Lincoln had to do was to obtain a certificate from the court of an Illinois county certifying to his good moral character. Abraham Lincoln never owned a slave during his life. Lincoln has no living descendants. The last descendant, Robert Todd Lincoln Beckwith died December 24, 1985. Lincoln was an animal lover from horses to dogs to cats--even letting his cat Tabby eat at the dining table in the White House. He did however, turn down an offer from the King of Siam of a gift of two elephants. In 1911 a spectacular fire destroyed the railroad car that transported Lincoln's remains back to Springfield but that train is being fully restored and should be ready by the April 15th sesquicentennial of his assassination. The Chicago History Museum has the bed where Lincoln died. If Lincoln had lived beyond his presidency, he planned to retire in Chicago.